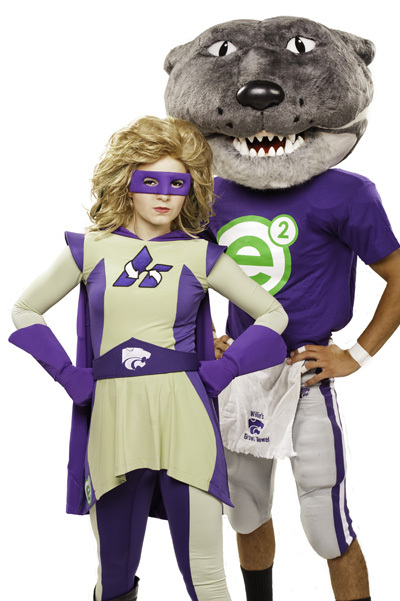 Remember the heinous energy efficiency mascot K-State unveiled last month? Well, Ecokat’s infamy has caused Lawrence plenty of distress, too. She was so badly famous that she’s been featured on the front page of the Huffington Post, and Manhattan has subsequently vaulted ahead of Lawrence in the Take Charge Challenge. Today Lawrence launches the #CHANGE5 campaign, which asks every single resident of Lawrence, students included, to change just 5 more bulbs in your home to CFLs, and then register them here. It’s one of the ways for us to win the $100,000 energy efficiency grant that’s up for grabs, and probably the most important at this stage in the game (the challenge ends next week). Short on light bulbs? That’s OK! We’ll give you one for free at the Lawrence Public Library tonight. I’ll be giving away free CFLs at our finale Take Charge Challenge event, which will feature a presentation by GouldEvans architects about energy upgrades to the new library, as well as a few remarks from Mayor Aron Cromwell. Hope to see you there! But if not, do make sure to at least #CHANGE5.